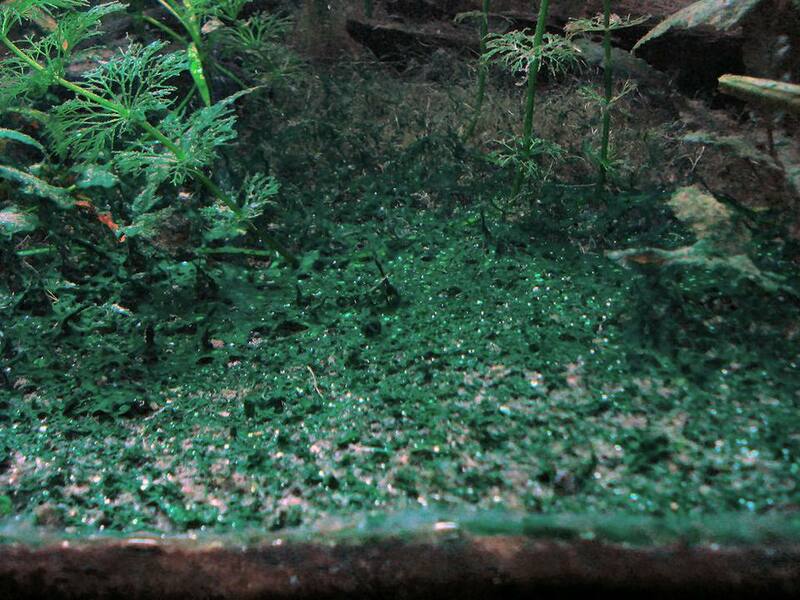 Cyanobacteria, often called blue-green algae, grow quickly and will cover all surfaces in the aquarium in short order. When disturbed, it comes off in sheets. It is also called slime algae or smear algae, which is an appropriate name as it is very slimy and often gives off an unpleasant swampy or fishy odor. A severe overgrowth of cyanobacteria can gather into foamy scum at the surface of the water. It is typically blue-green in color, but it can be greenish-brown to black or even red in color. A blue-green algae bloom can be directly toxic to fish if ingested and can kill fish indirectly by causing oxygen levels to drop below the threshold for fish survival. Blue-green algae is not truly an algae. Instead, it is cyanobacteria, an organism that lies somewhere between algae and bacteria. Overgrowth of this organism generally occurs when there are high levels of dissolved wastes and nutrients in the water, such as nitrates and phosphates. Phosphates, in particular, are a prime contributor to overgrowth of blue-green algae. The buildup of excess nutrients and dissolved waste may be due to lack of water changes and regular maintenance, overfeeding, or because the tank is new and the beneficial bacterial colonies have not become established. Cyanobacteria can also fix its own nitrogen levels and can even appear in a well maintained, mature tank. Once established, blue-green algae are rather difficult to eradicate. One way to eliminate it is by taking steps to reduce the nutrients and mechanically removing the algae itself. Start by scraping the glass, scrubbing the rocks and plants, and vacuuming the substrate. Perform a partial water change of 15 to 20 percent and turn the lights in the tank off for three days. On the fourth day turn the lights back on and perform another 10 to 15 percent water change. That should get rid of the algae overgrowth and reduce the elevated wastes and nutrients that support its growth. If there is still blue-green algae growth, the process should be repeated. Be aware that the algae will soon return if the underlying causes are not corrected permanently. In fact, it can never truly eliminated. However, regular water changes, maintenance, and preventive measures will eliminate the recurrence of a blue-green algae overgrowth. Another treatment option is the antibiotic erythromycin, which will kill the cyanobacteria that causes the slimy growth. However, the use of erythromycin can also affect the beneficial bacteria in the aquarium and should be used with care. If such treatment is used, monitor ammonia and nitrite levels closely for several weeks. Unlike brown algae, cyanobacteria are not eaten by algae eating fish like sucker-mouth catfish. So, do not count on these fish to help clean up your blue-green algae problem. As with any algae, keeping the tank clean and performing regular water changes are the best preventative measures. When water changes are not routinely performed, nitrates and phosphates will rise, which encourage algae and bacterial growth of all types. Performing small water changes every week or two will keep nutrient levels low. Overfeeding is one of the biggest causes of excess nutrients in the water that subsequently cause algae growth. Most fish do not need more than one feeding a day, and then only feed an amount that will be eaten in a few minutes. If food is visible on the bottom after 10 minutes, you are overfeeding your fish. Excess light, particularly direct sunlight, is another common cause of algae growth. Avoid placing a tank in a location where it will get direct sunlight. Unfortunately, it is still possible to get algae in spite of regular maintenance. In fact, small amounts of algae growth are normal. Prompt attention to sudden algae growth will prevent more serious problems.